Orally disintegrating tablets (ODTs) are coming into their own as mainstream pharmaceutical products. Oral thin films (OTFs) have also come into strong prominence with the launch of Suboxone® (buprenorphine and naloxone) thin films demonstrating a huge potential for thin films in prescription products. Statistics have shown that four out of five patients prefer orally disintegrating dosage forms over conventional solid oral dosages. These factors, coupled with convenience and compliance advantages, have been (and will continue to) pave the way for ODT and OTF drug product growth. 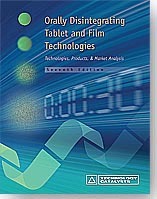 The ODT and OTF markets are discussed in depth in this latest edition of Orally Disintegrating Tablet and Film Technologies. Key information presented in the report includes the growing Japanese generic market, ODTs in the emerging markets, ODT and OTF pipeline analysis, innovative developments for delivery of proteins and peptides via ODTs and OTFs, and new nutraceutical thin film technologies and products. The report also includes a market analysis of both ODTs and OTFs, sales of leading ODT products from 2010 to 2011, ODT brand erosion by generics, late stage prescription OTFs, and the sales potential for OTFs with key APIs. Most importantly, the report contains screened and confirmed business and technology licensing opportunities from around the globe.